NASA Explorer Schools Feature Signals! 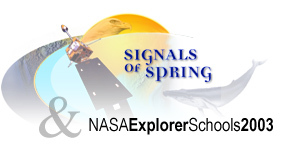 July 14, 2003 - NASA Explorer Schools is featuring Signals of Spring in NASA's First National Workshops this summer. Over the past six months, Signals of Spring has been contributing to NASA's Content Developers to allow this summer's teachers at NASA Stennis and NASA Kennedy, to be engaged in Signals of Spring. The short program includes a simulation using both animal and earth data. This way the hand selected Explorer Schools' teachers can get further training and participate in Signals of Spring in 2003-2004!